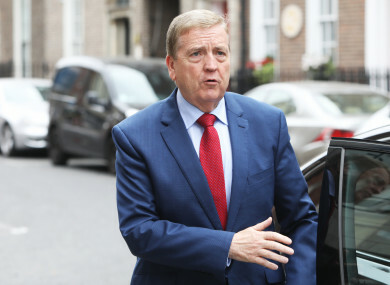 COLLEAGUES OF FINE Gael minister Pat Breen have defended his meetings with the head of the only consortium left in the running for the National Broadband Plan tender. Last night, the junior minister admitted he met David McCourt on a number of occasions, but said he had “no role in the National Broadband Plan, its rollout or its procurement”. That followed the resignation of Communications Minister Denis Naughten over revelations that he had also met McCourt on a number of occasions. Speaking to TheJournal.ie, Health Minister Simon Harris defended his colleague stating that Breen is not in a decision-making position. He said it is the responsibility of individual ministers to decide “is it appropriate for me to meet this minister, is it appropriate for me to attend this event, is it appropriate for me to attend this dinner, and the reality is, Naughten had a decision-making role, Pat Breen didn’t”. “Pat Breen asked a minister to meet a constituent, a neighbour, and Denis Naughten decided to do that,” he added. “The Taoiseach had no other choice and showed decisive action,” added Harris, stating that Varadkar showed leadership on the issue that many taoisigh in the past might not have and who would have let “ethical issues slip and slide”. Speaking on Morning Ireland on RTÉ Radio 1 this morning, Breen’s colleague Regina Doherty suggested that he had no questions to answer. “Pat Breen does not have any responsibility for the National Broadband Plan,” she said. Doherty also said that Breen’s role as a junior minister meant that he had to meet individuals such as McCourt. “Pat Breen is a minister in the Department of Business,” she added. “It’s his job to meet businesses and potential investors in Ireland, which is what he does on a weekly basis. Speaking on Newstalk last night, Tánaiste Simon Coveney revealed that Taoiseach Leo Varadkar intended to speak with Breen last night in order to understand the nature of his meetings with McCourt. Naughten appeared on Shannonside FM this morning where he disputed Varadkar’s account of when he was told about the former communications minister’s additional meetings with McCourt. He said he told Varadkar about the meetings in a Wednesday night phone call and not during their meeting on Thursday morning. “I mentioned those and said to the Taoiseach on Wednesday night. There is no reason for me not to be open and frank with the Taoiseach. I felt he needed to know that and I rang him Wednesday night and informed him of that,” he said. Harris said he did not think the controversy around the National Broadband Plan would bring down this government, but added that there is now a “renewed urgency for engagement with the Taoiseach and Fianna Fáil” and for a deal to be struck with the confidence and supply agreement “as quickly as possible”. Separately today, the Taoiseach indicated that he will nominate a new Minister for Communication shortly. He commented that new Ministers of State have to get Cabinet approval also, which indicates a junior minister is to be promoted. The next Cabinet meeting is due to be held on Tuesday. With additional reporting from Ceimin Burke. Email “'Pat Breen asked a minister to meet a constituent and Naughten decided to go'”. Feedback on “'Pat Breen asked a minister to meet a constituent and Naughten decided to go'”.